Rebecca holds a Masters with distinction in Historical Performance from Guildhall School of Music and Drama. 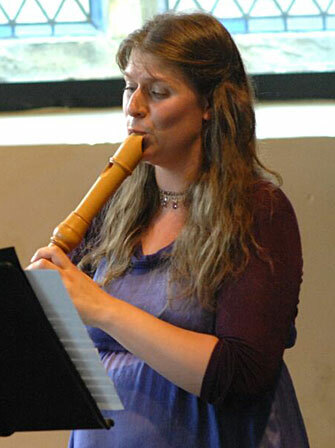 She performs on the recorder and with early music ensembles Royal Baroque & Bagatino, recorder consort Woodwork, and has also played for Fontanella, Poeticall Musicke and The Musicians of London Wall for a BBC radio 3 broadcast. A versatile musician, Rebecca is co-founder and conductor of Mosaic youth choir, arranging and performing a broad repertoire of European and British traditional and liturgical music. In addition she plays vielle, harp, whistles, cello and voice, touring with storyteller Anna Conomos and currently working on a series of recordings of Greek myths and folk tales. Rebecca’s creative collaboration with her sister, performer and composer Emma Hetherington, has produced composition, improvisation and arrangement of folk- roots repertoire for concerts and theatre (Actors of Dionysus). Recordings include Sardines (September 2009) The Sweetness of Honey (July 2014).